Secret patient waiting lists, delayed medical care, retaliation against whistleblowers are all reasons why trust in the VA hit an all-time low this spring especially on Capitol Hill. 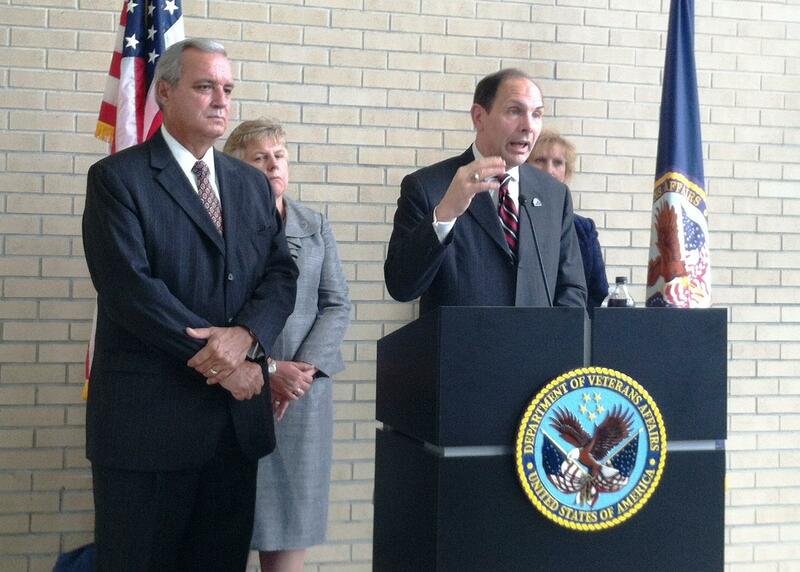 The new Secretary of Veterans Affairs, Robert “Bob” McDonald is trying to restore that trust. He’s started by visiting as many VA facilities as possible during his first 90 days in office. 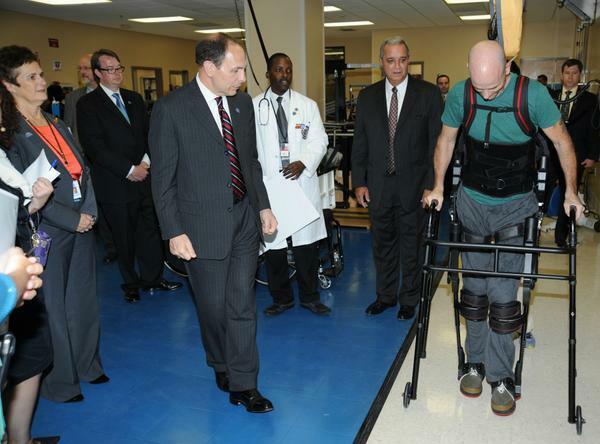 VA Secretary Bob McDonald (left) watches as paralyzed Navy Veteran Dwayne Scheuneman (right) demonstrates the Exoskeleton during the new leader's visit Wednesday at the James A. Haley VA Polytrauma Center. McDonald toured several Florida VA facilities this week and he invited U.S. Rep. Jeff Miller, Chairman of the House Committee of Veterans Affairs, to come along. McDonald says the formality of his position can get in the way of serving veterans. So, he insists that everyone call him “Bob” not “Secretary.” He has publicly shared his cell phone number and takes calls from veterans at all times of the day. As the retired CEO of Procter and Gamble, McDonald is all about improving customer service now and better forecasting veterans’ needs. A poster inside Tampa's James A. Haley VA announcing Wednesday's Town Hall meeting with the new secretary, Robert "Bob" McDonald. He blames a huge influx of veterans seeking benefits and care for many of the VA problems especially, when employee evaluations were linked to how fast veterans got scheduled and seen by a doctor. Bottom line, some veterans waited too long to see a doctor while others went without any care. McDonald said he is waiting on the results of 93 active Inspector General Investigations. “Some of those investigations are going to result in the Department of Justice being involved, some of them will result in the FBI being involved, and some of them could well result in criminal charges being brought,” McDonald said. A West Point graduate and veteran Army Airborne Ranger, McDonald said he has no tolerance for employees who don’t embrace a core value of the VA – the veterans come first. But he is equally ready to defend any VA employee who exposes a problem. On the left, U.S. Rep. Jeff Miller (FL-R) and on the right, VA Secretary Bob McDonald, during a news conference Wednesday at Tampa's James A. Haley VA Polytrauma Center. To improve access to medical care, McDonald extended clinic hours, used mobile clinics, and had people work overtime. “I’ve done some research and this may surprise you, but we don’t see the full effect of a war in terms of impact on Veterans Affairs until 40 years after the war,” McDonald said. And he wants the VA to be ready when that influx of Iraq and Afghanistan war veterans hits in 2054. Looking for suggestions on how to improve service and shorten wait times throughout the VA system, the new Secretary of the Department of Veterans Affairs visited Florida this week to hear directly from veterans, VA employees, veteran service organizations and VA administrators. Secretary Robert McDonald- who likes to be called Bob - said progress is being made on speeding up medical appointments and decreasing the wait for benefit claims. As an example, McDonald said the national backlog of disability claims has been reduced 57 percent from its peak in March 2013. 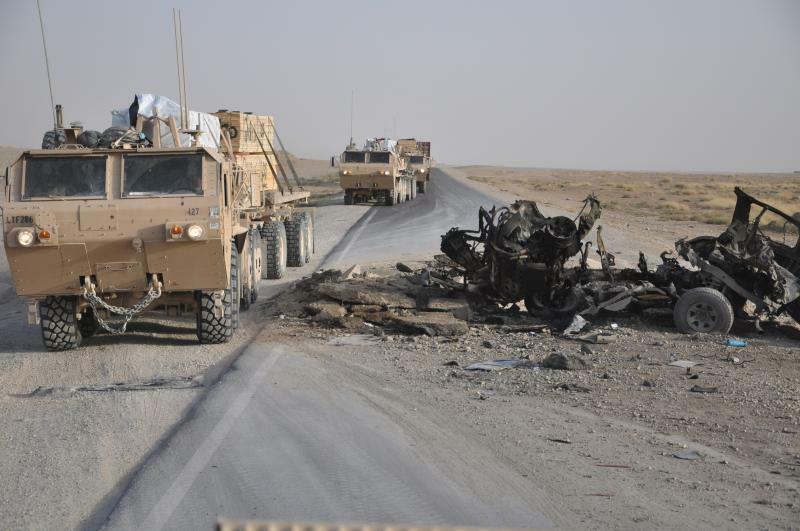 Evasive driving maneuvers like speeding and sudden lane changes are a must for troops driving in dangerous environments where there may be roadside bombs, like Afghanistan. But the driving habits that can save a soldier’s life when deployed can cause an accident and maybe death when the soldier returns home.